A while ago I mentioned how I had started attending Bikram hot yoga classes. At the time I said I wasn’t exactly enjoying them. Now, after 20 classes, I can firmly say that was an understatement. Not only do I not like Bikram yoga, I hate it. Strong words? Perhaps. But true. I gave it a chance. People told me it would get better. It does NOT get better. I hate it, I hate it, I hate it! Wooo, that felt good to get off my chest! Some people would question why I would attend so many classes if I dislike it so much. It’s partially because I’m stubborn and hate giving up on things and also because I saw results with Bikram yoga. I felt myself getting stronger and more flexible and quite quickly too. But those good things are more than cancelled out by the fact that it’s such a struggle to force myself to attend classes because of how terrible I feel before, during and afterwards. Before the class I’m anxious, wondering if I had drank enough water throughout the day to hydrate myself, how I’m going to feel during this particular class, how hot it’s going to get, (it varies depending on how many people are in attendance and on whether the instructor decides to regulate the heat or not) and if I would make it early enough to get a good spot. During the ridiculously long 90 minute class I struggled to make it through each day without getting dizzy and having to lie down, without feeling faint and without falling out of too many of the poses. After the class, during the time that you’re supposed to feel rejuvenated and ready to take on the world, full of energy and pep, I felt like I had been run over by a bus, thrown off a cliff and then put through a washing machine. All I want to do after each Bikram yoga class is curl up into a ball and sob quietly, drink a fruit smoothie and then eat mass quantities of baked goods to undo all the potential good I had just done in class, to make me feel better. 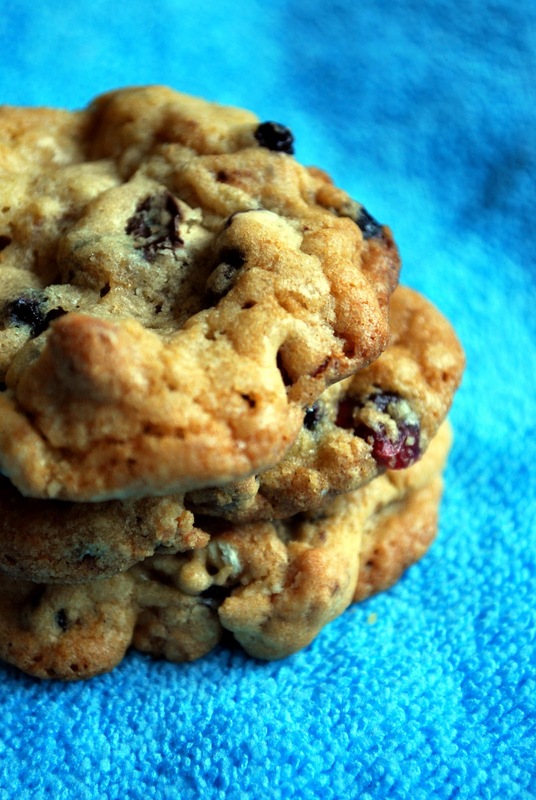 These amazing cookies are the exact opposite of Bikram yoga. They might not be good for me as far as caloric content goes, but they more than make up for that in the happiness that they bring. These cookies make me want to hug strangers, tip 110% and help old ladies cross the street. They just generally inspire goodwill. I originally had the idea that I wanted to use pretzels in a cookie as I love salty/sweet combos, so I bought a bag of pretzels to facilitate this. But then I started to eat the pretzels on their own and before I knew it I was left with about a cup and a half of pretzels left. I knew cookie time was then or never, so I got to work. 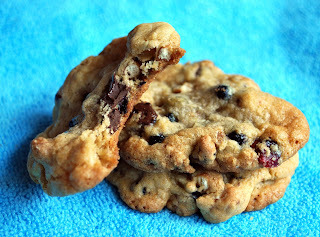 I started with Alton Brown’s recipe for Chewy Chocolate Chip Cookies and tweaked it to my satisfaction, by browning the butter first and then adding not only chocolate chips but also crushed pretzels and dried cherries, cranberries and blueberries. The end result? Cookies that make life ok again, even after a hellish Bikram yoga class, and that’s quite the accomplishment! Melt the butter in a heavy-bottom medium saucepan over low heat. Continue to heat until the butter turns brown and smells wonderfully nutty. Be careful as it will go from lovely and brown to black and burnt quite quickly. Pour the melted butter in the mixer's work bowl. Add the sugar and brown sugar. Cream the butter and sugars on medium speed. Add the egg, yolk, 2 tablespoons milk and vanilla extract and mix until well combined. Slowly incorporate the flour mixture until thoroughly combined. Stir in the chocolate chips, pretzels and dried fruit. Chill the dough, then scoop onto parchment-lined baking sheets. Bake for 10-12 minutes or until golden brown, checking the cookies after 5 minutes. Rotate the baking sheet for even browning. Cool completely and store in an airtight container. Posted by Brilynn at 10:37 p.m.
excellent storytelling and adaptation of a classic cookie recipe. hahaha! I felt the same way about bikrams. who wants to be that hot on purpose?! I'd certainly give this a go. I love the sweet/salty combo too and this would have an extra crunch as well. The cookies look and sound fabulous. Much, much better than hot yoga! I love all of the extras you tossed. Hey, with all that fruit, they're practically health food, right? This cookie looks amazing - love the sweet and salty! Yum, these look great! I've always wanted to try Bikram, but I figure I'm getting the equivalent out here with the Saigon heat and the instructors do not turn on the AC.